USA Win's Men's 1st, Women's 1st and Combined 1st!!! Led by #1 player Rhonda Rajsich, the USA women defended their world title. Although ill earlier in the week, Rhonda rebounded with a tremendous upset victory over singles world champion Christie Van Hees. 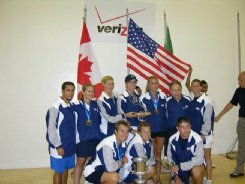 Rhonda's victory was even more significant when the USA doubles team of Laura Fenton and Aimee Ruiz lost to the Canadian doubles team. If Rhonda had lost her match the team title would have gone to the Canadians, but the victory meant that it was up to Cheryl Gudinas to win the title for the USA women. After what most people would agree has been one of the most successful careers ever as a USA team player, it was fitting that the championship came down to Cheryl's match. Cheryl showed everyone why she is the ultimate team player, and beat Canadian Jen Saunders in two straight, thus giving the Women's championship to the USA. In the Men's team competition, Jack Huczek easily beat Canadian Kris Oddgard and then the doubles team of Jack Huczak and Rocky Carson destroyed the Canadian team of Brian Istace and Mike Green (2,4). Although #2 Shane Vanderson did not get to play (since the championship was already decided), Shane's earlier victory against Alvaro Beltran of Mexico was a pivotal victory in the tournament. Congratulations to the team, and especially to the coaches Dave and John Ellis who survived some very difficult situations to bring this team together and repeat as World Champions.